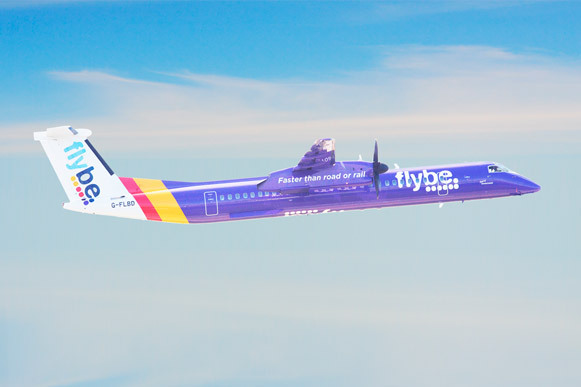 The UK's Civil Aviation Authority's Air Accidents Investigation Branch praised the pilot of a FlyBe Bombardier Q400 for his professionalism in coping with an incapacitated co-pilot on a flight from Inverness to Jersey last year. In the AAIB report issued this week, into the incident of 5th August 2017 told how the co-pilot has suffered a seizure while the aircraft was flying at 25,000 feet with 43 passengers in the back of the Bombardier turboprop Q400. The co-pilots sudden and violent seizure had caused the autopilot to be disengaged and the co-pilots sudden movements affected the aircraft, a cabin crew member was knocked off her feet and helped up by a passenger on the flight. The senior cabin crew member went to the flight deck after speaking with the pilot on the intercom and tried to restrain the co-pilot who had gone grey in the face with a blue tinge to the lips. The job of the senior cabin crew member was made more difficult by the stiff limbs of the co-pilot, however, she managed to move him as far back as she was able. The pilot declared an emergency and with air traffic control support began a diversion to Manchester Airport, the nearest suitable airfield. However, it became “physically demanding” to restrain the co-pilot due to his limbs “flailing and going stiff” the report contains and the pilot considered this could cause a danger, especially in the final approach to Manchester. Because of space, it was not possible to remove the co-pilot from the seat so an able-bodied passenger was selected to be close to the cockpit in case he was required to assist the cabin crew member should the need arise. The pilot carried out a safe and relatively normal landing and directed to a parking stand where paramedics removed the co-pilot and took him to hospital. He was released some three hours later and had not previously shown any signs any illnesses that might cause seizures. The AAIB said this was a “serious incident” which was “professionally managed” by the commander and cabin crew. A Flybe spokesperson said “Airlines train their crew to be prepared for all possible incidents including, however rare, that of a pilot becoming incapacitated during flight. The report duly recognises that the crew immediately and efficiently implemented the required precautionary procedures necessary to ensure the continued safe operation of the aircraft and the flight landed safely without further incident."